Biography: Octaviana Trujillo has worked over the past three decades in the area of educational program development for Native Americans. She was the founding Director of the American Indian Graduate Center at the University of Arizona, where she later was Assistant Professor in the Department of Language, Reading and Culture and affiliated faculty with American Indian Studies. 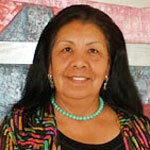 In 1994, Octaviana became the first woman to become chairman of the Pascua Yaqui Tribe of Arizona. During her tenured leadership, she established the first department of education for the Tribal Nation and shepherded state and national legislation. Octaviana subsequently served at Arizona State University as Director of the Center for Indian Education and editor of the Journal of American Indian Education, the nation’s longest continually published refereed research journal on Native education. During her tenure there, she secured extramural research funding that quadrupled ASU’s Native education research, preparation of Native teachers and graduate students for the professorate. She served as the principal investigator of US Office of Educational Research and Improvement (OERI) funded Native educator’s research project, Native Educators: Interface with Culture and Languages in Schooling, to explicate the programmatic elements within diverse teacher preparation programs that prepare Native pre-servce teachers to effectively situate their teaching within the cultural context of their students’ lives. Her interest in peace and human rights advocacy has included work in the Middle East, Mexico, Northern Ireland, Colombia, Ecuador and Bolivia. Dr. Trujillo was the founding chair of the Applied Indigenous Studies Department at Northern Arizona University. She is principal investigator of the National Science Foundation grant, Research Collaborative: Native Science Curriculum. Her work on Yaqui ethnohistory and language policy has produced work in three languages and includes publications Hiapsi Wami Seewam: Flowers of Life and The Yaqui: A People and Their Place. Most recently, she has worked with the United Nations and US Department of State, Fulbright Program with Indigenous Peoples human rights and leadership development.